This is an example to show, how to create a record in SAP HANA table with the sequence ID, using the xsodata and xsjslib exit methods while creating a record. The code written is in eclipse . This blog will help you to return back the ID in the frontend created with SAPUI5 application. Creating Xsodata with xsjslib exit method. Creating a xsjslib function to create a record with back end sequence number. Creating session.xsjslib to call in the exit function. Sample SAPUI function to create and return the sequence ID. Following are the steps to achieve the above-mentioned goal. 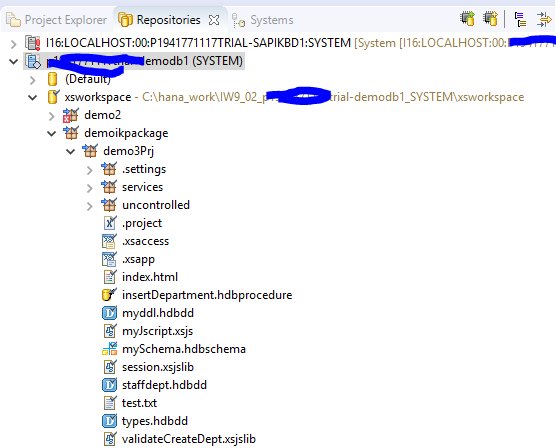 Create a xsoData file in the SAP HANA development perspective, in this case, the file name is staffinfo.xsodata in the services folder show in the figure above. 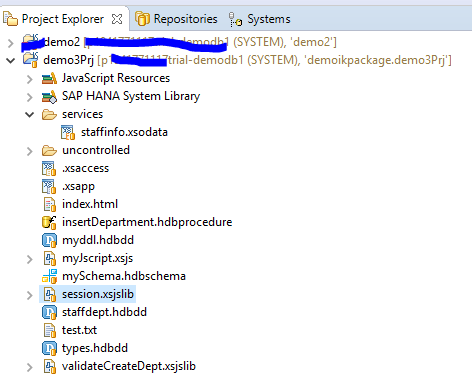 Here we are using the xsjslib (“demoikpackage.demo3Prj:validateCreateDept.xsjslib::createAndReturnSeqNo”) while creating the record in the HANA table “DEMOIKEMPLOYEE”.”STAFFDEPT”. validateCreateDept.xsjslib is the xsjslib file name and createAndReturnSeqNo is the function which will be called to create the record, using the sequence generator created in SAP HANA system. Call the xsodata from the SAPUI5 application to create a record in HANA table with the DEPTID and DEPTNAME , DEPTID will be populated with the number used from the sequence generator. Code for the SAPUI5 function which will create the record, the success function will return the ID (newDeptId = response.data.DEPTID) created from the Sequence. After completing the steps listed above, you will be able to create a record with sequence id and return the value in the SAPUI5 application.